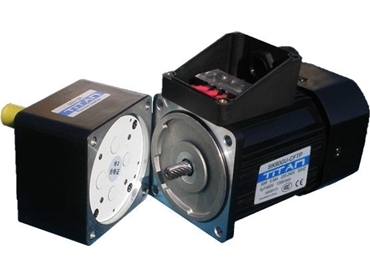 The Maili Titan range of Single Phase 240v Precision Industrial Gear motors is now available from Motion Dynamics . The range consists of Speed Control, Induction, Reversible and Electromagnetic Brake Type motors in all common sizes including 60mm 6W, 15W, 80mm 25W, 90mm 40W, 60W, 90W and 120W with common gear reduction between 3:1 - 200:1. The Maili Titan range of Single Phase 240v Precision Industrial Gear motors are based on the original "Oriental Motor Company" motor. They feature a heatsinked case together with active fans in the higher wattage motors for highly effective heat dispersion. They are supplied in a terminal box configuration (apart from all 6w gear motors, speed control motors and electromagnetic brake motors). These gear boxes can easily be converted to lead wire just by removing the terminal box and terminal mounting block. The Maili Titan range of Single Phase 240v Precision Industrial Gear motors are suited to a wide range of applications, from industrial automation systems running 24/7, to oyster sorting, small elevators and lifts, food processing industry, and many others.